Not to be confused with Eyelet. For the Welsh indie band, see Islet (band). For human anatomy, see Pancreatic islets. Ait(/eɪt/, like eight) or eyot (/aɪ(ə)t, eɪt/) is a small island. It is especially used to refer to river islands found on the River Thames and its tributaries in England. Cay or Key – an islet formed by the accumulation of fine sand deposits atop a reef. In Normandy and the Channel Islands, they are often identified by the French suffix -hou from the Scandinavian -holm. 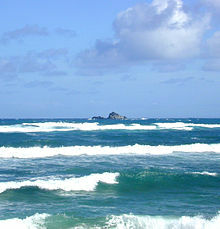 Whether an islet is considered a rock or not can have significant economic consequences under Article 121 of the UN Convention on the Law of the Sea, which stipulates that "Rocks which cannot sustain human habitation or economic life of their own shall have no exclusive economic zone or continental shelf." One long-term dispute over the status of such an islet was that of Snake Island (Black Sea). The International Court of Justice jurisprudence however sometimes ignores islets, regardless of inhabitation status, in deciding territorial disputes; it did so in 2009 in adjudicating the Romania-Ukraine dispute, and previously in the dispute between Libya and Malta involving the islet of Filfla. There are thousands of islets on Earth: approximately 24,000 islands and islets in the Stockholm archipelago alone. The following is a list of example islets from around the world. Granite Island (South Australia), Victor Harbor, South Australia. ^ Hance D. Smith (1991). The Development of Integrated Sea Use Management. Taylor & Francis. p. 82. ISBN 978-0-415-03816-4.